I normally do not write about my private life outside of any wine related activities. However, I am very excited that after ten years of living in Silver Spring we are moving to Chevy Chase View. You might have noticed that the combined process of buying a new house then selling our current house is occupying a significant portion of my time. For the next several months it will continue to be hard to maintain my normal schedule of research and writing. So if there are gaps in my tasting notes or less historical posts you now know why! Chevy Chase View is a town located north of Bethesda and south of Kensington, just outside of the Beltway. It came into existence in 1909 then was first platted in 1910. Construction during the first dozen years was slow, resulting in just four houses. Despite the lack of construction parcels of land were actively sold and bought. 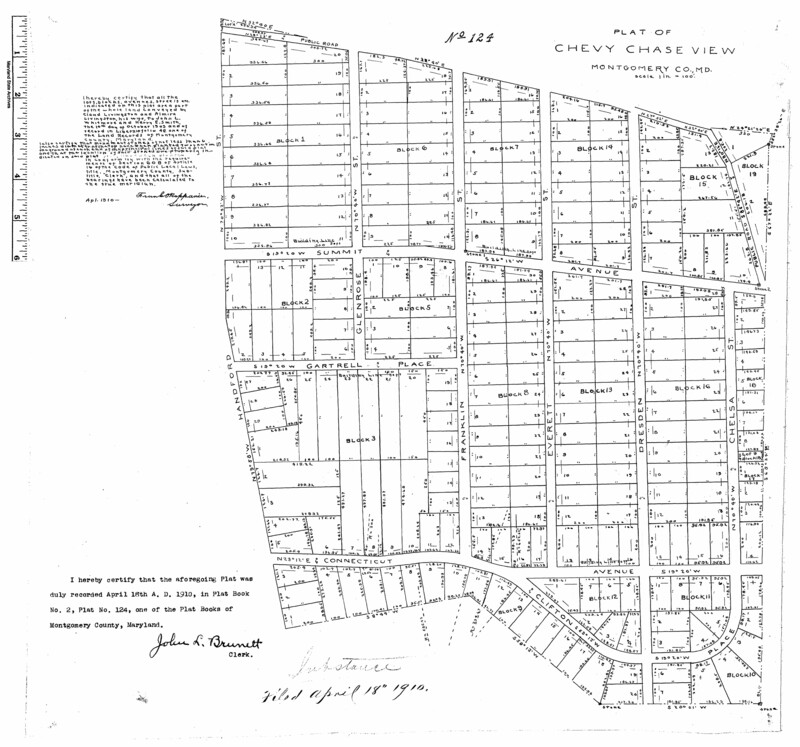 One large parcel, upon which our house would eventually be built, was purchased by investor Charles E. Wire in 1916. In 1923 there was a wave of new activity led by real estate developer Harry M. Martin and Charles E. Wire. 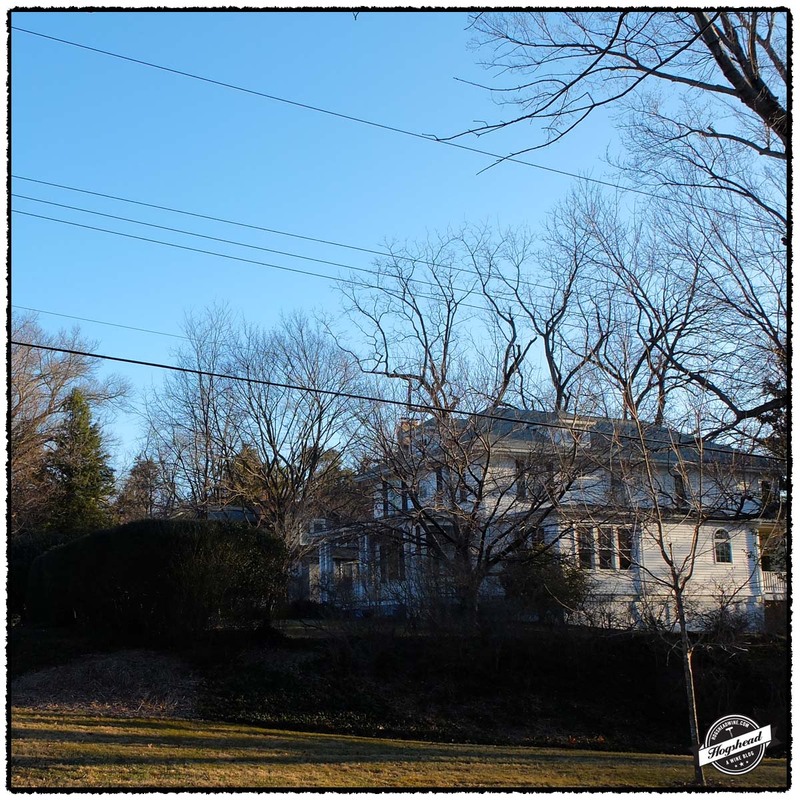 It was in this year that Charles E. Wire resubdivided the eastern portion of his large parcel in Chevy Chase View. 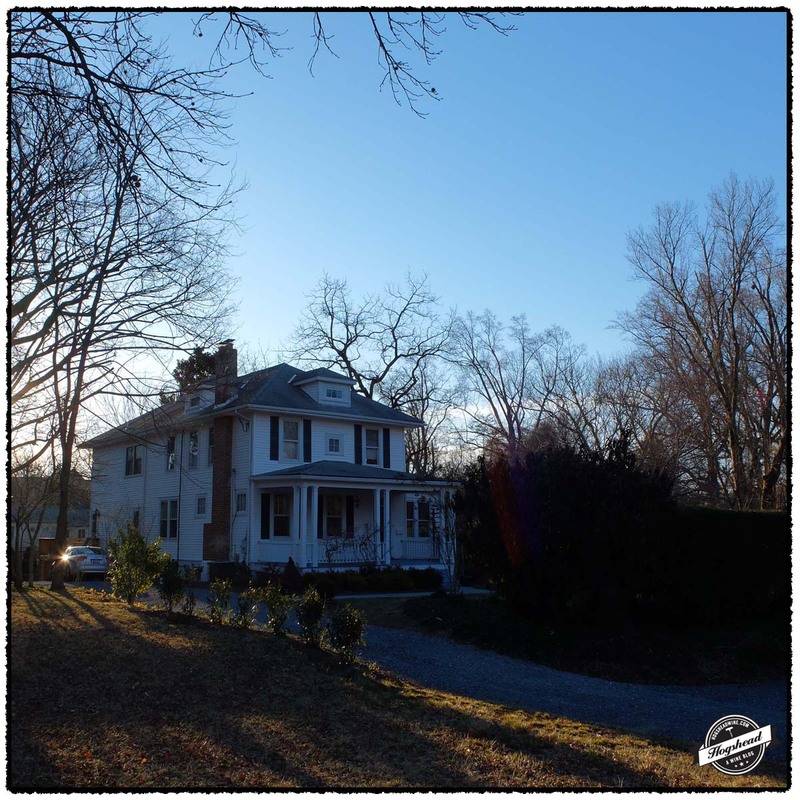 If the names Martin and Chevy Chase sound familiar that is because Harry M. Martin developed the land around Chevy Chase inside of the Beltway. These parcels are known as Martin’s Additions. Plat 124. Chevy Chase View, Harry E. Smith and John L. Whitmore. 1910. Maryland State Archives. Some 20 houses were eventually built that year in 1923. Harry M. Martin ran a series of advertisements in The Evening Star and The Washington Post. The altitude of Chevy Chase View was regarded as providing cooler temperatures, less humidity, and great views. The Kensington Railway offered alternative transportation if one did not want to drive into the city. The houses were all on large lots each with water, sewerage, and electricity. The very next year Chevy Chase View became a special taxing zone which laid the foundation for the charter and regulations that now govern it. Over the decades both citizens and political committee members have preserved the original feel with the large wooded lots. Chevy Chase View was incorporated as a town in 1993. As a town, it is rather unique for there are only some 300 single-family homes, a swimming pool, and four churches. 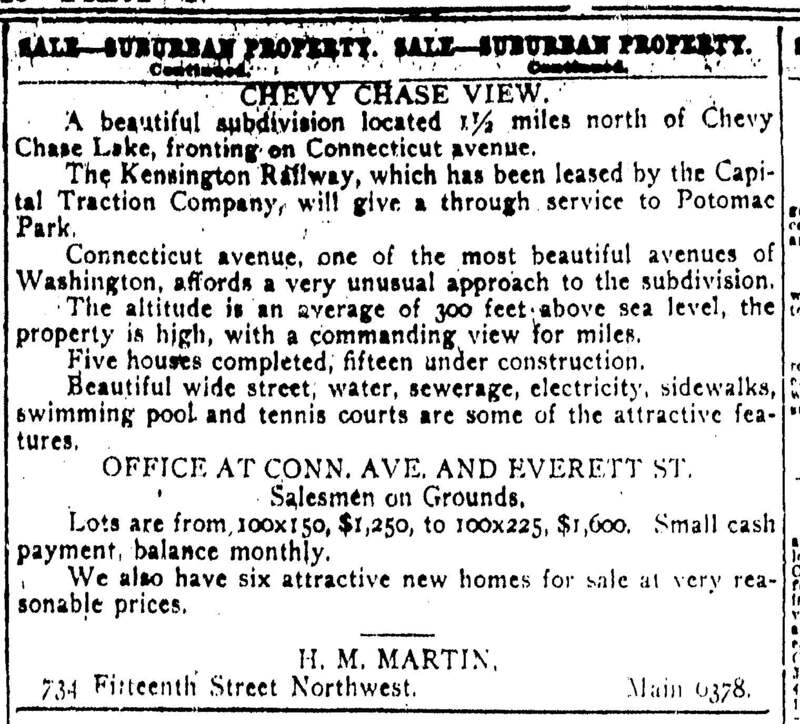 Chevy Chase View advertisement by H. M. Martin. May 20, 1923. The Evening Star. Our house was built in 1923 then expanded and fully renovated in 2000. For us this offers the perfect blend of original features such as windows, doors, floors, and hardware along with modern conveniences like dual-zone forced-air heating and air conditioning. There is a large dining room where I will be able to host wine tastings. For the storage of wine there is a basement and for my Madeira, there is a walk-up attic. The house itself sits on a large lot. With both covered and uncovered decks along with a flat backyard, I cannot wait to host my first wine party this summer. 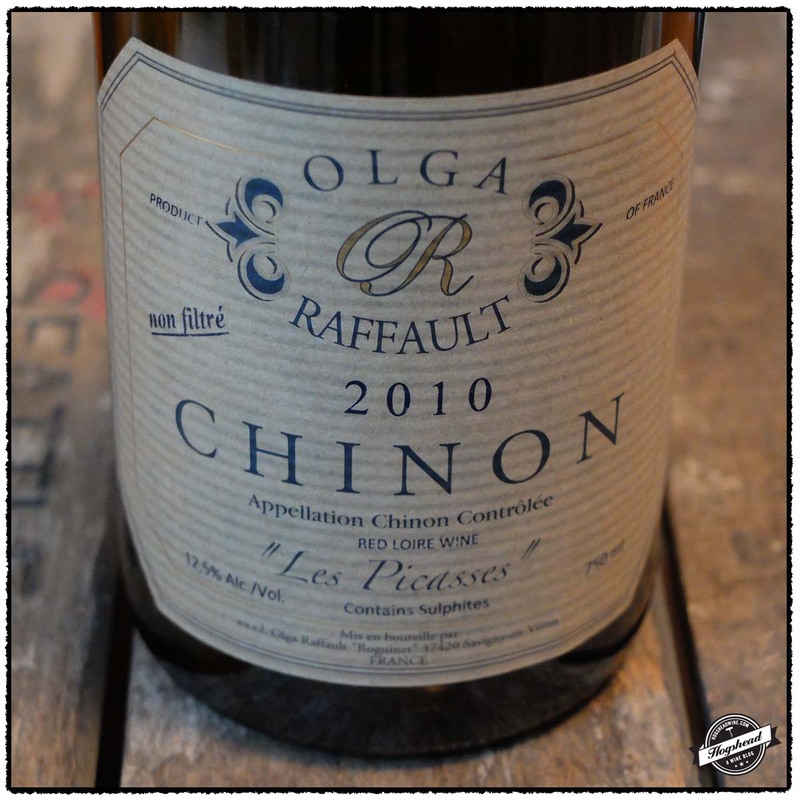 Both the 2010 Olga Raffault, Les Picasses, Chinon and 2013 G. Descombes, Régnié engage you with their aromas then draw you in with contemplative flavors. The Raffault showed the most complexity but it also barely budged over two nights. There is a clear record that this wine ages very well so I suggest you simply bury a few bottles in your basement. The Descombes is an impeccably made wine that will not tire you out as you drink glass after glass. You should try them both. These wines were purchased at MacArthur Beverages. Imported by Louis/Dressner. This wine is 100% Cabernet Franc sourced from roughly 50 year old vines on a riverbank slope with soils of limestone and clay. It was fermented then aged for 12 to 16 months in large casks. Alcohol 12.5%. It had the sort of earthy, complex nose that always makes me wonder how it came to be. There were firm flavors of black and red fruit before the wine became drier with a seamlessly integrated, drying tannic structure and prominent graphite notes. There was a lipsticky middle before a rather delicate, perfumed finish, and earthy aftertaste. There is a sense of lightness but this is a young wine that has some weight and will age very well. ***(*) 2018-2025. Imported by Louis/Dressner. This wine is 100% Gamay. Alcohol 12.5%. There was a nose of wet tea and scented spices. In the mouth were tart and lean red fruit flavors that took on fresh pepper in the finish. The wine was gently rounded with some weight. The acidity was perfectly integrated as was the moderate, drying structure. It took on some wood notes. *** Now-2020. The wines features in today’s post feature a wide variety of styles. 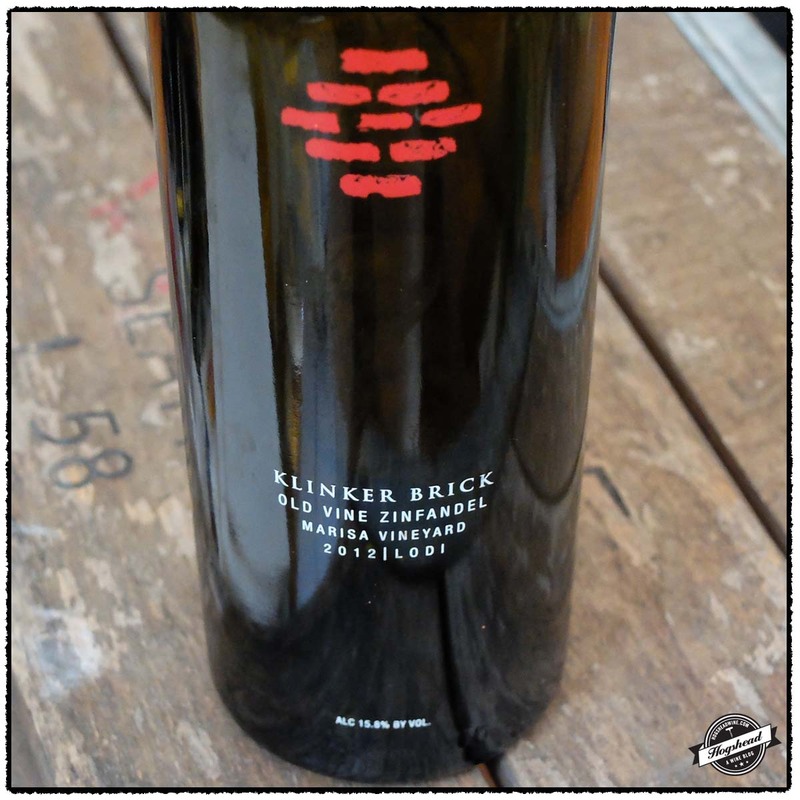 My favorites include the 2012 Klinker Brick, Old Vine Zinfandel, Marisa Vineyard, Lodi with its attractive cherry and Manhattan cocktail flavors, for lack of a better description. It simply tastes different. The wine is still young so hold off on opening a bottle for a bit. 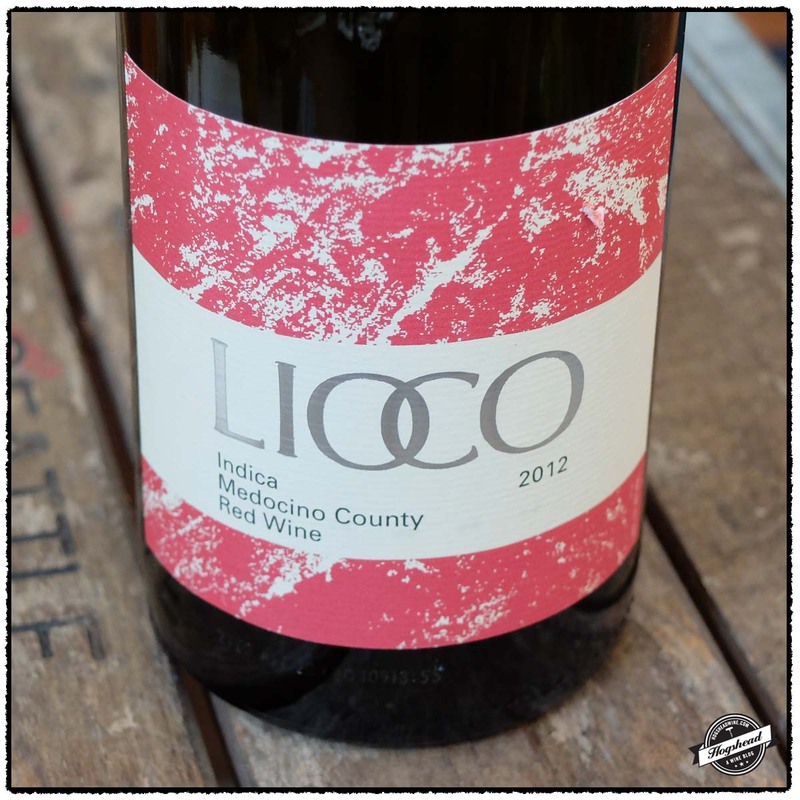 The 2012 Lioco, Indica Red Wine, Mendocino County returns with very clean red berry flavors and low alcohol. 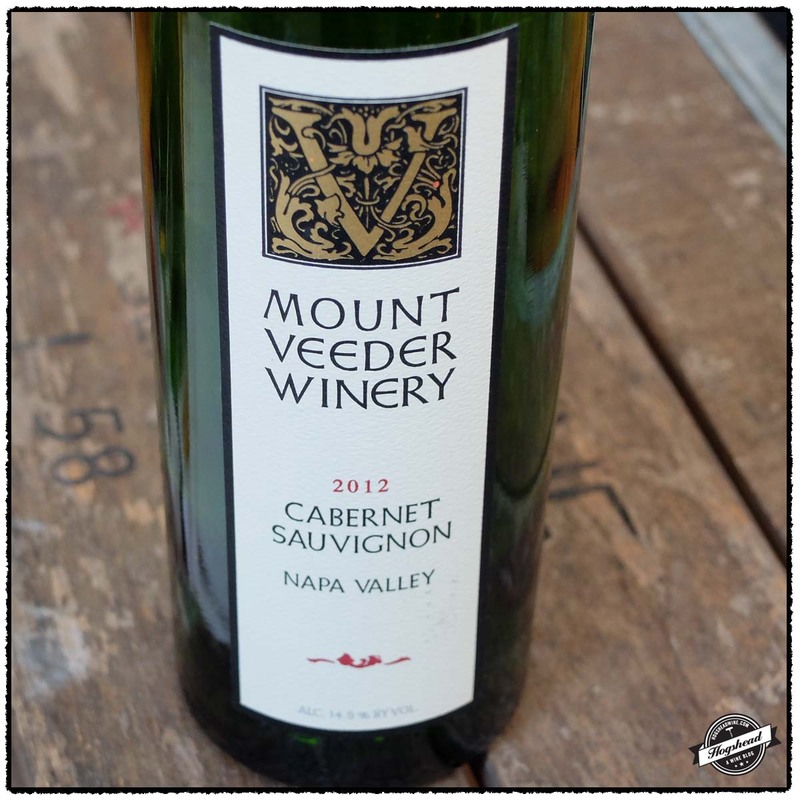 The 2012 Mount Veeder Winery, Cabernet Sauvignon, Napa Valley is well done at a fair price. It offers a good combination of greenhouse infused black fruit, ripeness, minerals, and structure. I rather enjoyed it. 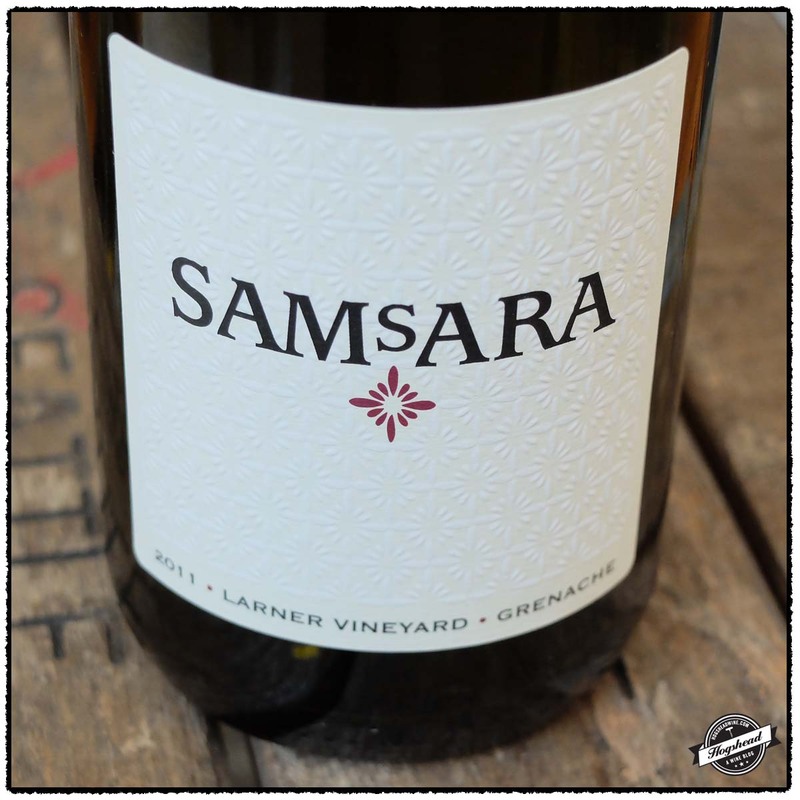 Finally, the 2011 SAMsARA, Grenache, Larner Vineyard, Santa Ynez offers a different take on Grenache, that being a uniquely aromatic nose followed by more tart fruit. These wines were purchased at MacArthur Beverages. This wine is a blend of 40% Grenache, 18% Syrah, 18% Mourvedre, 14% Cinsault, and 10% Counoise that was fermented with indigenous yeast in neutral oak vats. Alcohol 14.2%. 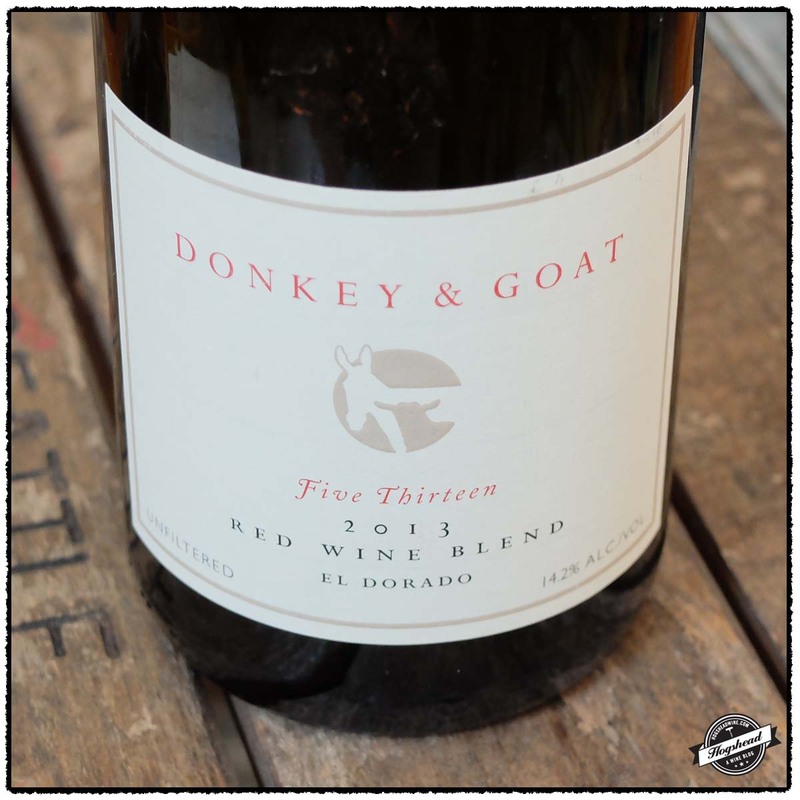 With only a hint of natural wine aromas, the nose bore higher-toned, citric red fruit aromas. The mouth followed with red grapefruit flavors at the start. There was a ripe, citric pith structure and tart flavors in the back of the mouth. There were ripe, ethereal flavors that puffed up in the finish. This is a wine for the short-term. ** Now-2017. This wine is 100% Zinfandel sourced from vines averaging 85 years of age that was aged for 15 months in 60% new American oak. Alcohol 15.8%. There was enjoyable fruit from the start that had an incense character with both a little fat and weight. There was a light structure that brought subtle spices and wet tobacco. After a few hours of air the fruit developed an attractive core of cherry and Manhattan cocktail flavors. It had some glycerin to the mouth feel. Thought it started to unwind with air it should develop in the cellar. *** 2016-2022. This wine is 100% old-vine Carignan that was fermented in stainless steel then aged for 11 months in neutral oak. Alcohol 12%. The red fruit on the nose made way to flavors of tart cherries and eventually strawberry. The tart red berries persisted with ethereal black fruit underneath and a slightly powdery texture. Attractive clean flavors. *** Now-2017. This wine is a blend of 83% Cabernet Sauvignon, 11% Merlot, 3% Petit Verdot, 2% Malbec, and 1% Cabernet Franc. Alcohol 14.5%. The nose preceded the mouth with ripe, greenhouse infused flavors of black fruit. There were powdery tannins, minerals, and a black fruited finish. The acidity supported the wine which filled the mouth. It left flavors of tart black and red fruit in the finish along with a little chocolate. **(*) 2016-2021. This wine is 100% Grenache which was whole cluster pressed, fermented with indigenous yeast then aged 24 months in 100% neutral French oak. Alcohol 14%. The nose was fragrant with notes of creamsicle! In the mouth were clean fruit and almond flavors around a powdery core. There was some weight to the body and a finish that brought both drier flavors and more structure. With air the wine developed more minerality that went with the firm acidity. It took an interesting tart orange, citrus, natural wine bit at the aftertaste. *** Now-2020. We tasted through three South African white wines from the 2012 vintage before the single-digit cold spell hit Washington, DC. 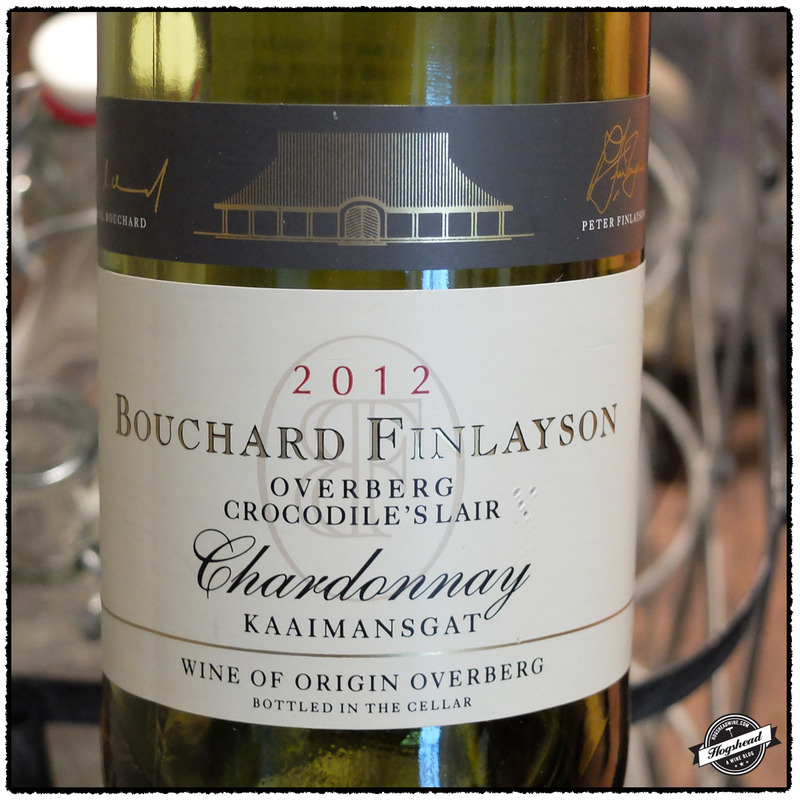 The 2012 Bouchard Finlayson, Chardonnay, Crocodile’s Lair/Kaaimansgat , Overberg was the most acidity oriented of them all. For me I kept noticing the acidity more than the white fruit flavors. While the profile of the wine might change with age, right now it is perfect for those acidity hounds out there. 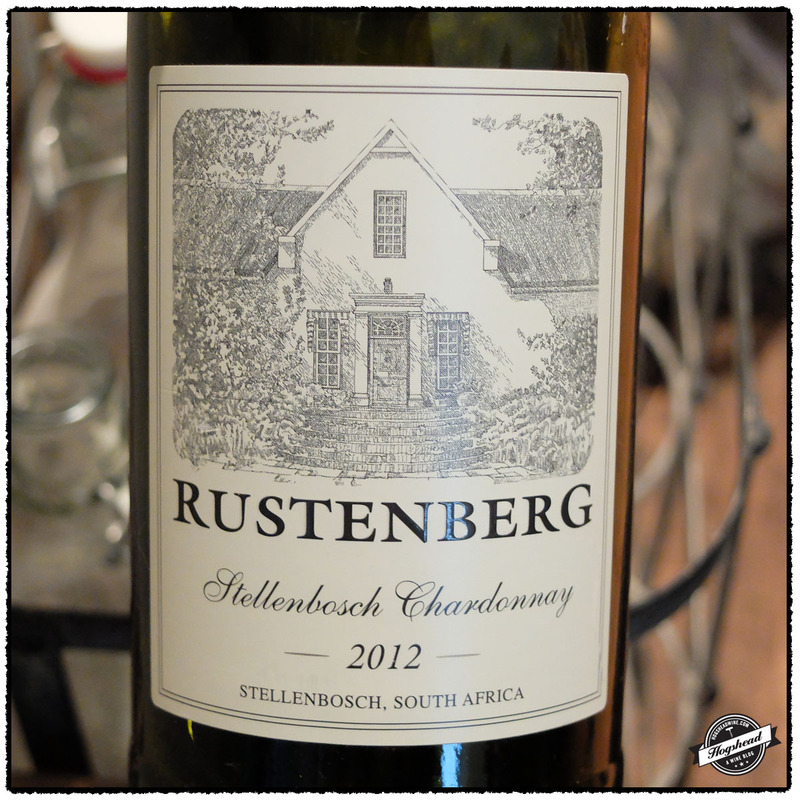 The 2012 Rustenberg, Chardonnay, Stellenbosch was clearly raised in oak. It is not overwhelming, rather a complement to the yellow, creamy, and spiced flavors. We have enjoyed previous vintages of this wine and with this one, I would recommend holding it until the fall to let the oak integrate more. 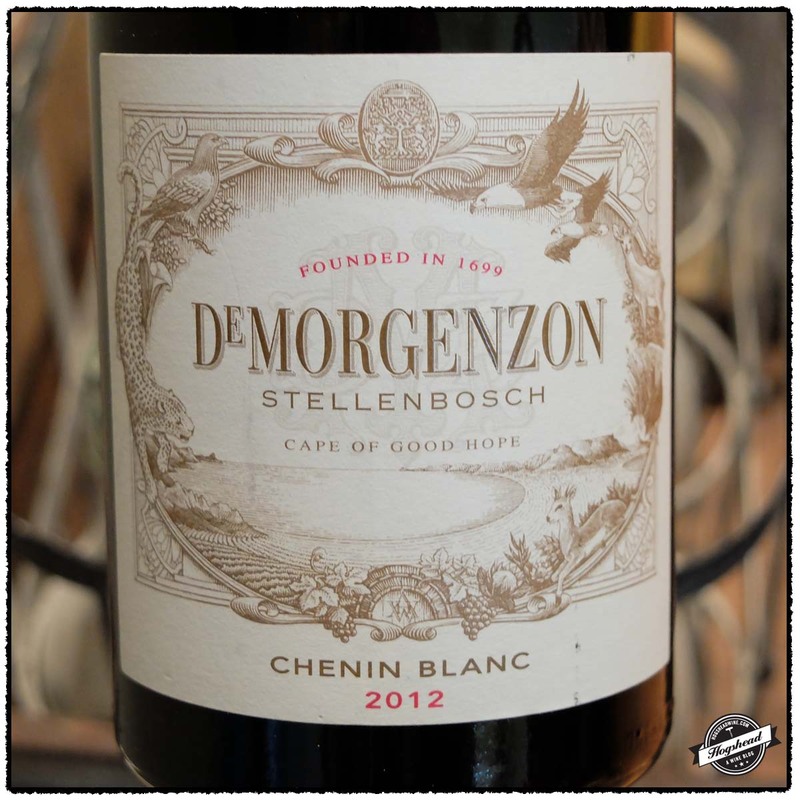 The 2012 De Morgenzon, Chenin Blanc, Stellenbosch shifts in grape variety and in price. Though young and in need of age it already exhibits dense, rich, tart fruit that has a beguiling petrol or honey flavored middle. Like the Rustenberg, it too needs time in the cellar, but this will develop over a longer period. 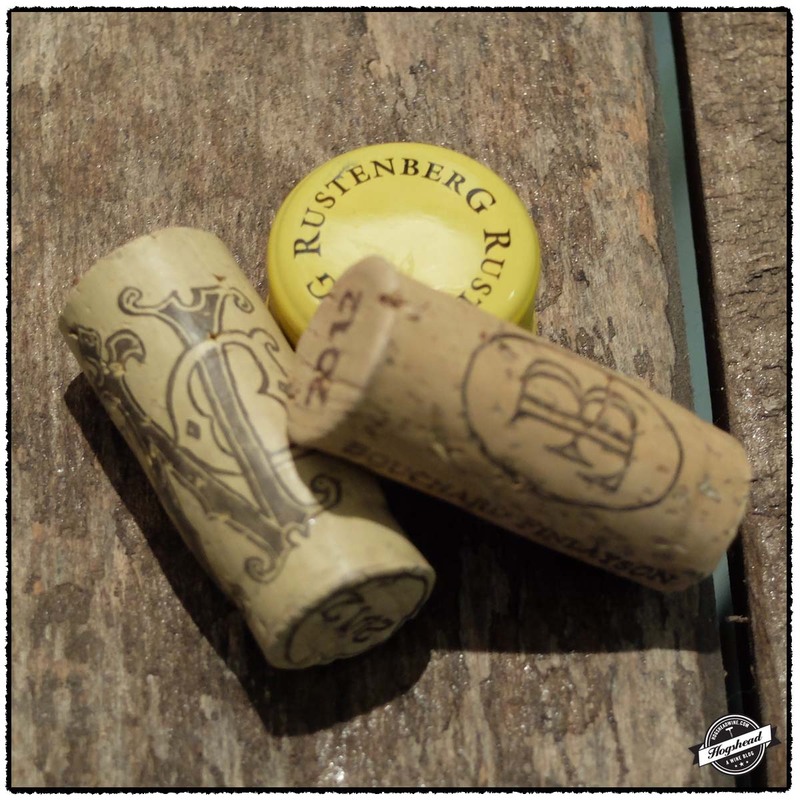 Both the Rustenberg and De Morgenzon have a lot to offer at their price points. These wines were purchased at MacArthur Beverages. Imported by Indigo Wine Group. This wine is 100% Chardonnay that was aged for 8 months in 25% new French oak barrels. Alcohol 13.5%. The color was copper accented golden straw. There was focused white fruit flavors with lively acidity. The wine has some weight but presents itself as lighter with more lively, watering acidity. In fact, the acidity is more noticeable than the fruit. It also has a subtle texture. ** Now-2018. Imported by Indigo Wine Group. This wine is 100% Chardonnay sourced from vines on soils of decomposed granite that was aged for 12 months in 40% new Burgundian hogsheads. Alcohol 14%. The wine was a bright straw color with toasty yellow and white fruit aromas. In the mouth were somewhat weighty flavors that expanded quickly. The acidity was lively from the start whereas the toast notes slowly built through the finish. The wine takes on a creamy and spiced middle with creamy finish and a lighter aftertaste accented by some toast. *** Now-2017. Imported by Cape Classic. This wine is 100% Chenin Blanc sourced from 41 year old vines that was fermented with indigenous yeast in French oak barrels. Alcohol 14%. The color was a golden straw. The nose was floral with chalky yellow fruit aromas. In the mouth the flavors reflected the color with dense, rich, tart yellow fruit that had plenty of texture. There was a petrol-like, perhaps honey, flavor in the middle, ripe lemon notes in the finish, and a persistent aftertaste. ***(*) Now-2020. 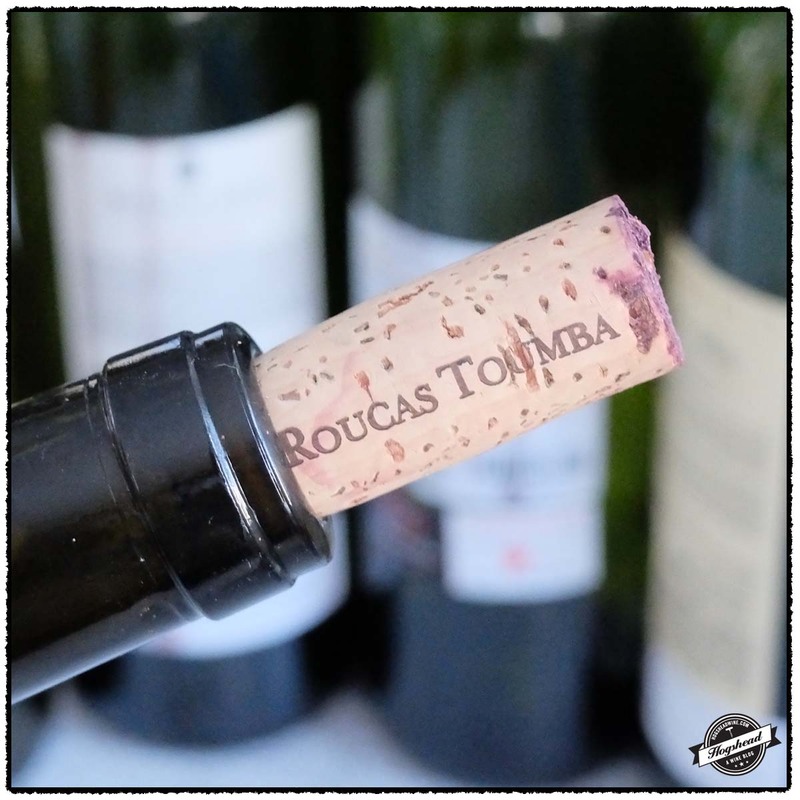 The estate of Roucas Toumba near Vacqueyras has been in the Bouletin family since the 18th century. Historically, the fruit was delivered to cooperatives and sold to Beaucastel. It was only in 2000 that wine was first made at the estate. 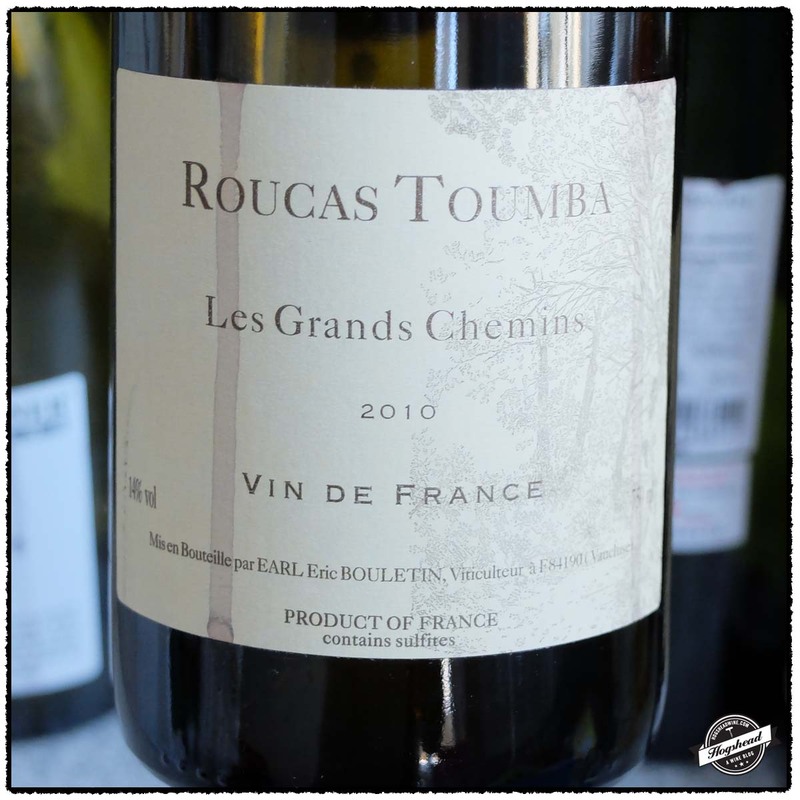 I tried the 2010 Roucas Toumba, Les Grands Chemins which is primarily declassified Vacqueyras from old-vine Grenache and Carignan planted in 1948. This is a lovely wine ready from short-term cellaring. 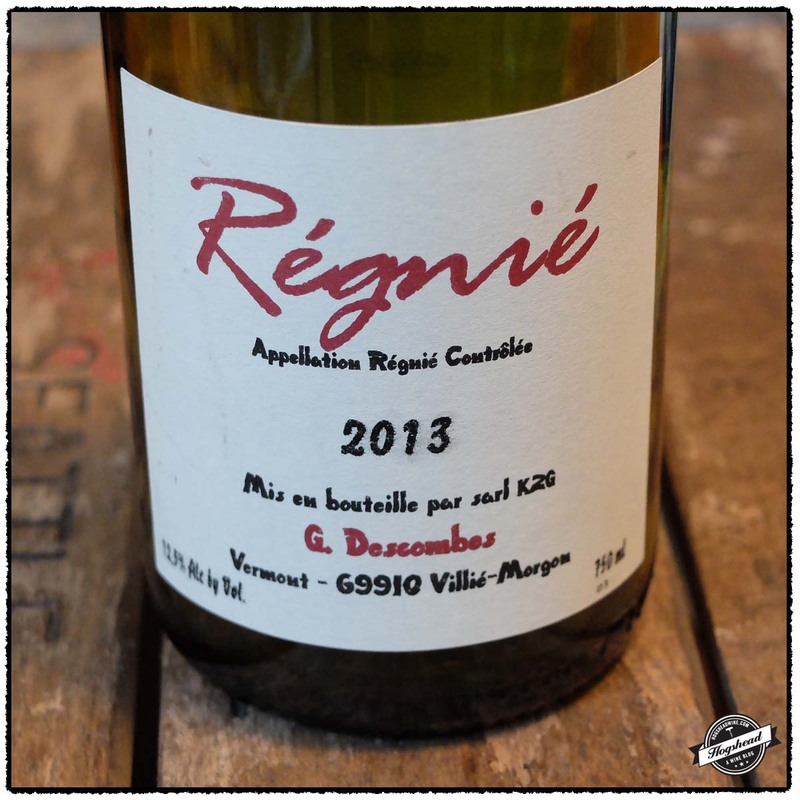 There is already good complexity with that sense of warmth from Vacqueyras. While I would hold off drinking this for a year, you might be excused for cracking a bottle given the record-breaking cold weather. This wine was purchased at MacArthur Beverages. Imported by Potomac Selections. This wine is a blend of 65% Grenache, 25% Carignan, and 10% Syrah that was aged for six months on concrete vats. Alcohol 14%. There were spiced berry aromas and occasional wafts of animale notes. In the mouth were ripe black fruit flavors with the structure framing the entire wine. A mineral, black acidity developed on the tongue that worked towards a ripe, spiced finish with cola like flavors. Perhaps clean, macerated black fruit is a better description. The wine was firm at the end with a drying aftertaste. *** 2016-2025+? This past Friday I found myself as Phil’s guest at his monthly wine-tasting group. 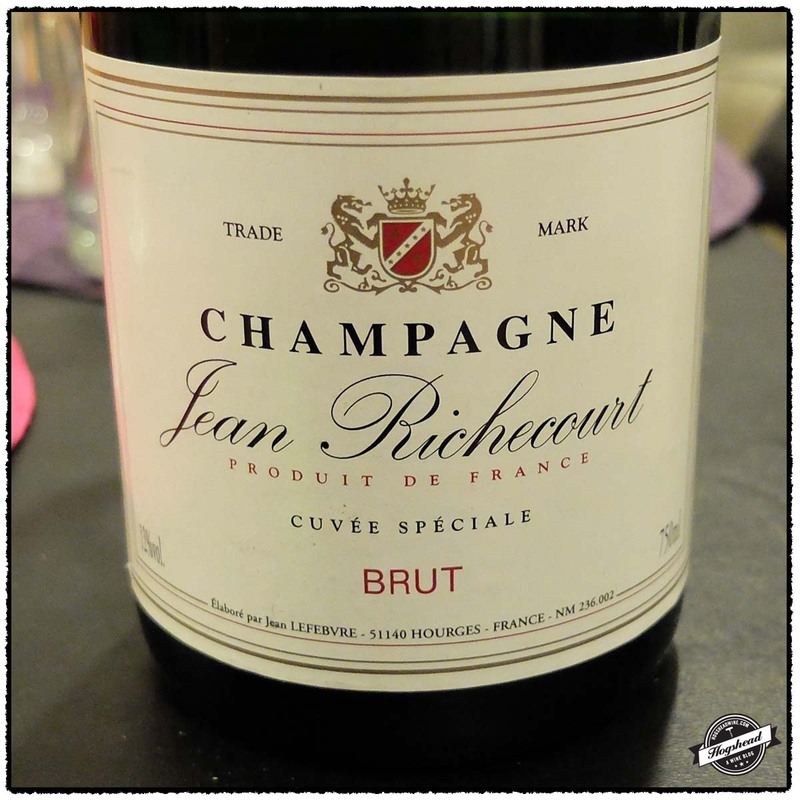 We sipped on the perfectly agreeable NV Jean Richecourt, Cuvee Speciale, Brut, Champagne as we waited for everyone to show up. I found the citrus flavors and gentle effervescence whet my appetite for some serious wine. The tasting of the red wines was conducted blind. 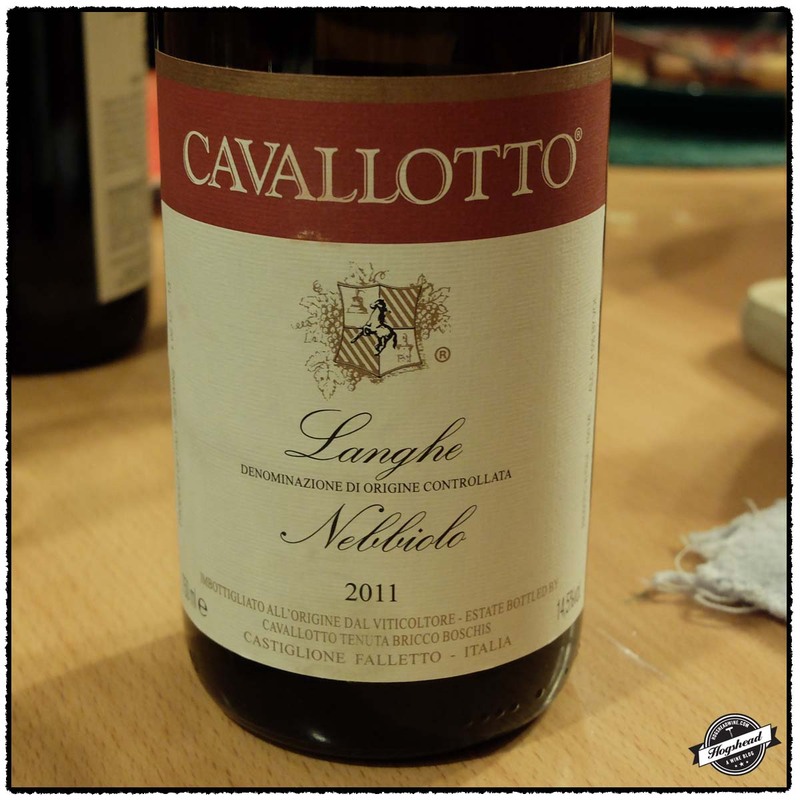 The nose alone of the 2011 Cavallotto, Nebbiolo, Langhe was a great start. It was surprisingly serious for such a wine which, in retrospect, is explained by it being made from declassified Barolo Bricco Boschis fruit. 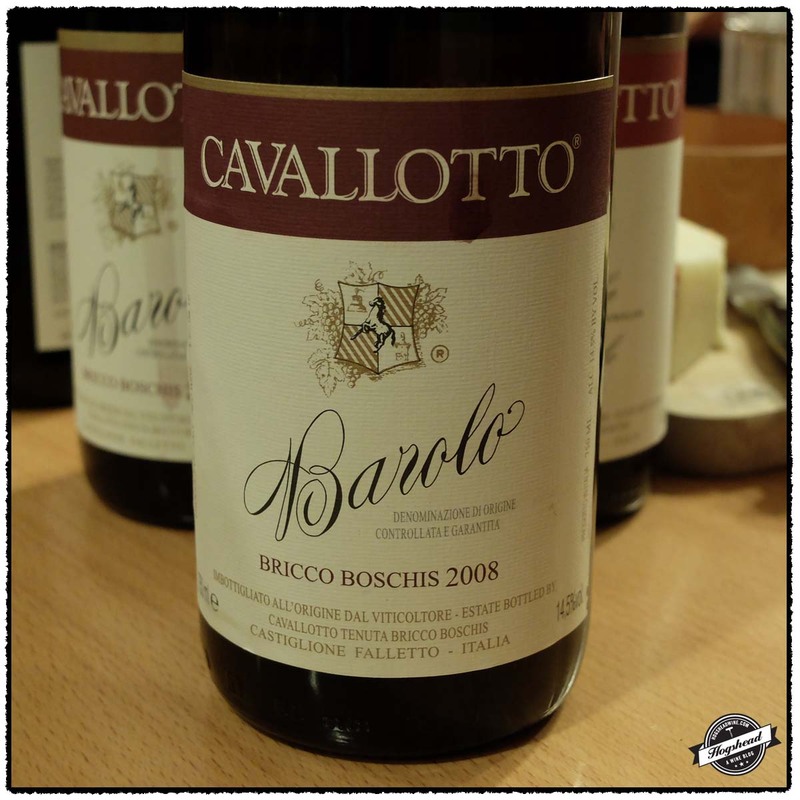 It was a good thing then that the remaining wines were all Cavallotto, Barolo Bricco Boschis. 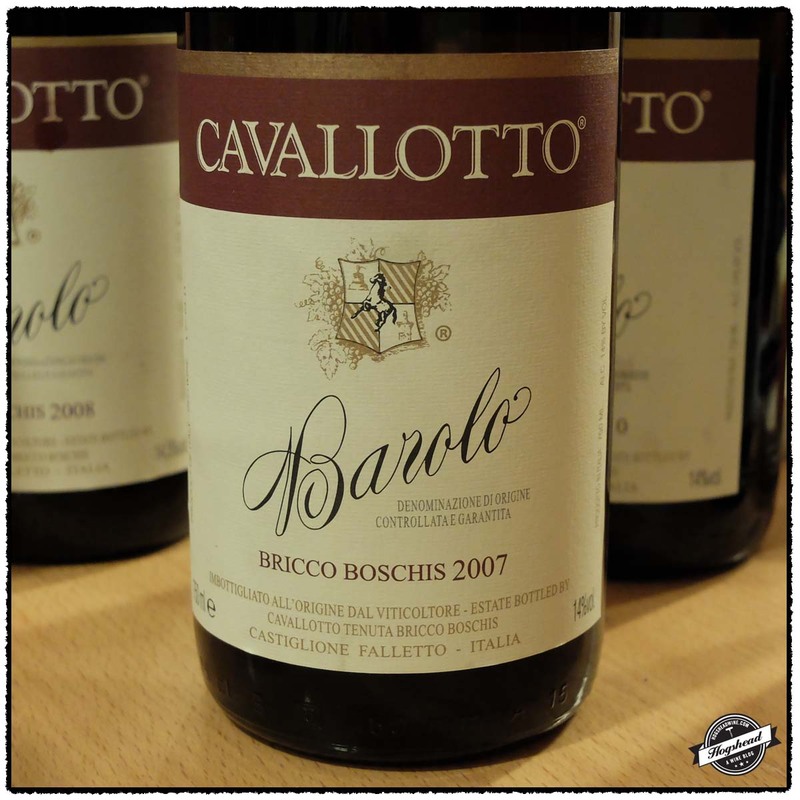 Bricco Boschis is a cru solely owned by the Cavallotto family since 1929. These wines are traditionally made with long aging in Slavonian oak. Though they could exhibit a strong structure they all remained approachable. Unfortunately the 2010 vintage was corked and the 2006 was believed heat damage, it was “old”, but still tasty in a way. 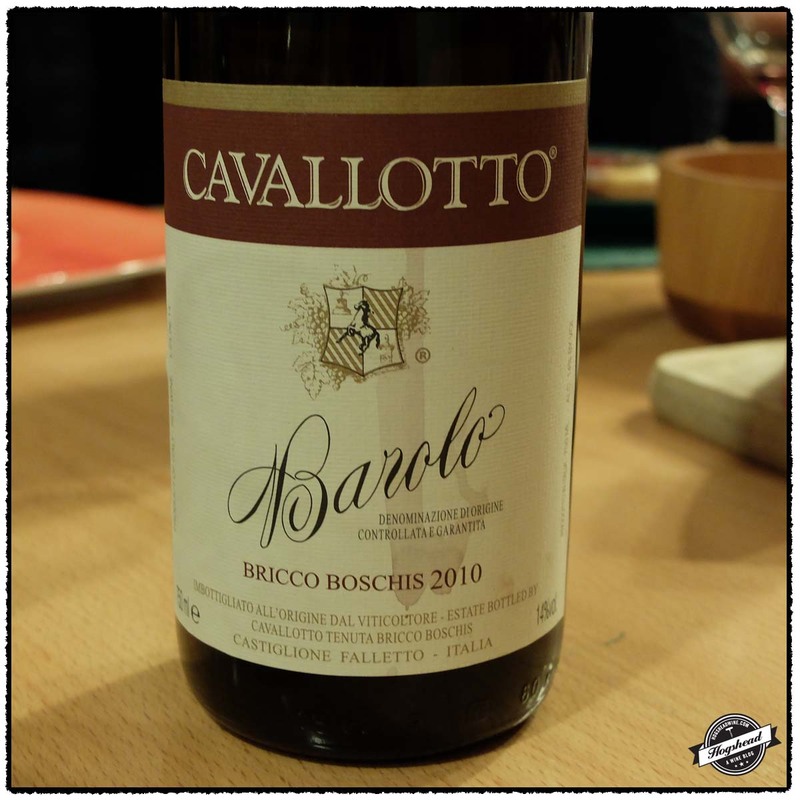 The 2008 Cavallotto, Barolo Brico Boschis was expectedly young but the minerally, racy black fruit was very attractive. There is good potential here but I would wait several more years before opening another bottle. 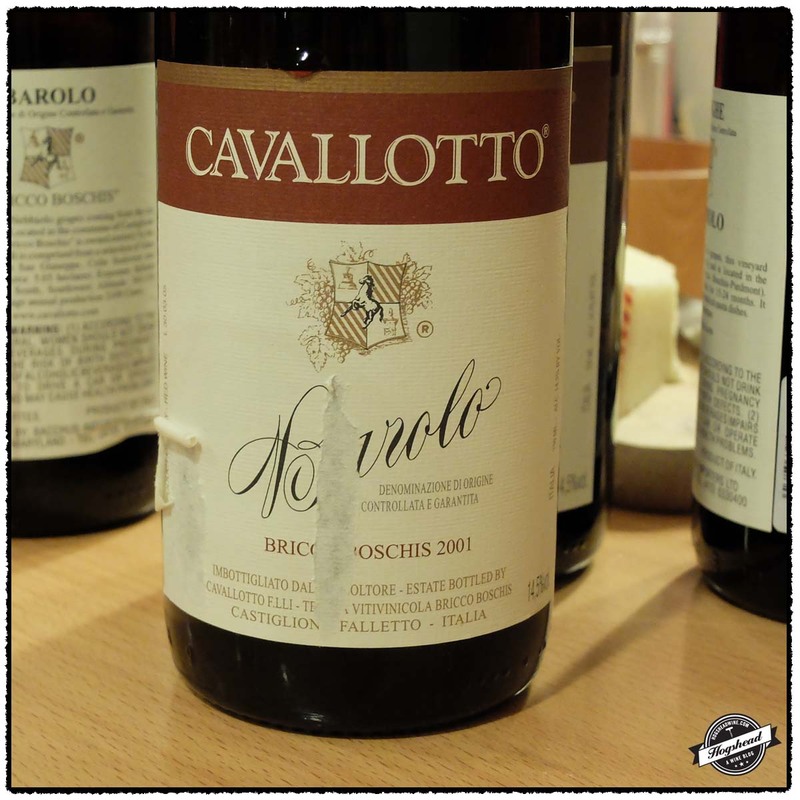 The 2007 Cavallotto, Barolo Brico Boschis sported a good amount of concentrated fruit in a manner that came across as young. It developed an interesting animale flavor in the finish. I would try this again with the 2008. 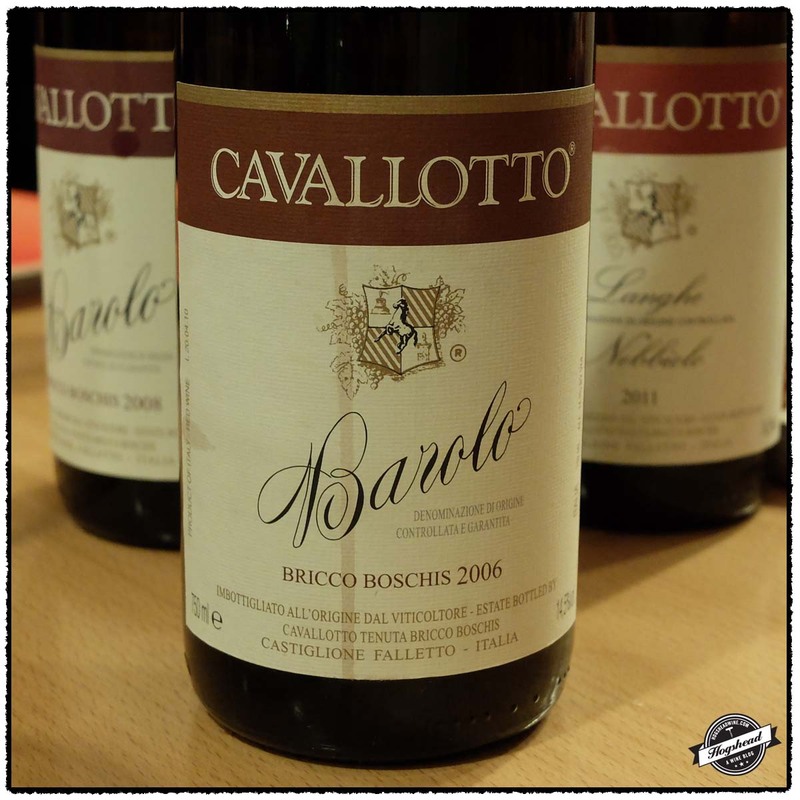 The 2001 Cavallotto, Barolo Brico Boschis was easily in a place of its own. The fruit was beautiful as well as the balance with the acidity and structure. This was a serious yet enjoyable wine that was the first to be finished. 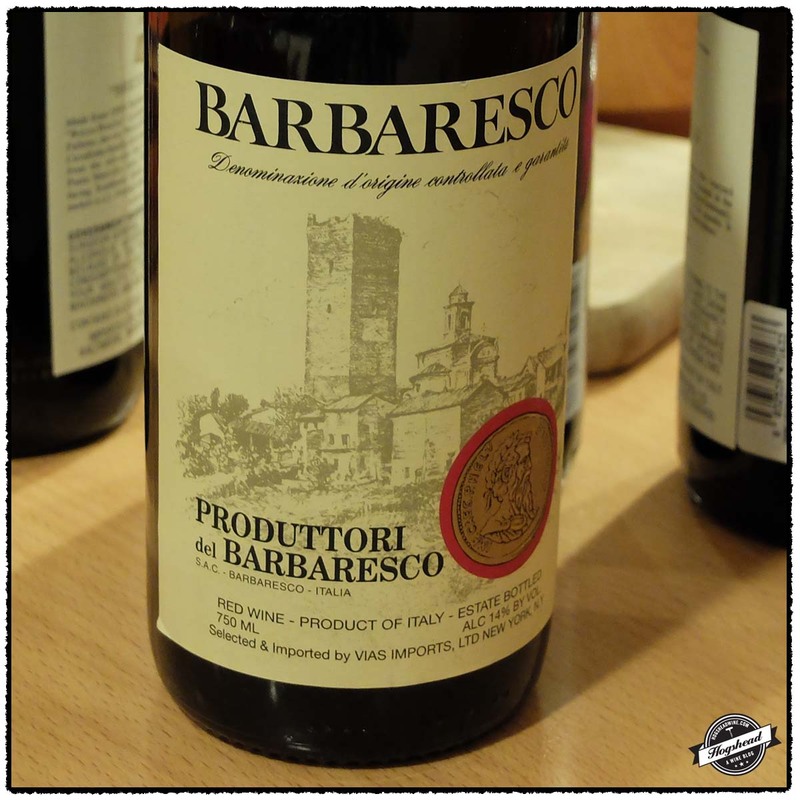 The 2005 Produttori del Barbaresco, Barbaresco proved a nice change at the end with its dark, dense fruit. I did not spend much time with my glass but I should have. We were very fortunate to finish with another excellent wine from the 2001 vintage. This time in the form of the German 2001 Selbach-Oster, Zeltinger Himmelreich, Riesling Auslese *, Mosel Saar Ruwer. It was everything I love in a German Riesling with its incredible aromatic nose, weighty mature flavors, and vibrant acidity. I would have drunk the whole bottle if it were not impolite. Thanks again to Phil for inviting me and for preparing the satisfying dinner of lamb shanks. Imported by The Lexington Import Group. Alcohol 12%. There were light lemon flavors with spiced, yeast notes, and gentle effervescence. This fresh wine made for an easy start. ** Now. Imported by Bacchus Importers. This wine is 100% Nebbiolo that was aged for 15-24 months in oak barrels. Alcohol 14.5%. The color was a light to medium garnet cherry. The nose was aromatic with exotic potpourri. In the mouth the black fruit developed a little heat but there was good flavor to the ripe fruit. The acidity was there with drier flavors in the finish and persistent aftertaste with mineral notes. Drinking well now but should continue to do so. *** Now-2020. Imported by Bacchus Importers. This wine is 100% Nebbiolo sourced from calcareous and clay soils that was fermented in stainless steel then aged in 3.5 years in Slavonian oak casks. Alcohol 14%. 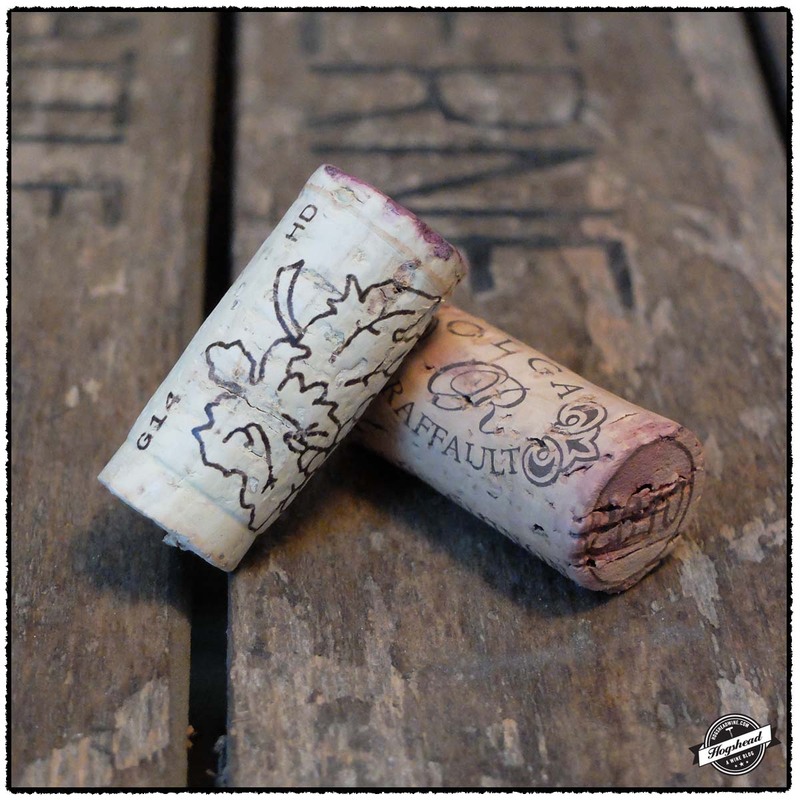 Corked. Imported by Bacchus Importers. This wine is 100% Nebbiolo sourced from calcareous and clay soils that was fermented in stainless steel then aged in 3.5 years in Slavonian oak casks. Alcohol 14.5%. It had a light to medium color with more garnet. The nose was less exotic than the introductory Nebbiolo but there were similar cherry scents. The red fruit in the start had more focus before minerally, racy black fruit came out. There were very fine, powerful tannins with integrated acidity. This strong wine was bright with acidity, a leather hint, and citric tannins. ***(*) Now-2030. Imported by Bacchus Importers. This wine is 100% Nebbiolo sourced from calcareous and clay soils that was fermented in stainless steel then aged in 3.5 years in Slavonian oak casks. Alcohol 14%. This was a garnet color that looked younger than the 2006. The nose was subtle with dark aromas. There was more fruit that was concentrated and tasted young. There was an attractive animale note in the finish. The wine tastes young and was matched by very fine, drying tannins. It clearly needs more time. ***(*) 2018-2028. Imported by deGrazia Imports. This wine is 100% Nebbiolo sourced from calcareous and clay soils that was fermented in stainless steel then aged in 3.5 years in Slavonian oak casks. Alcohol 14.5%. This was an older looking garnet wood. The nose was piercing with older (not in the prime of maturity) aromas. In the mouth there was still some fruit concentration, old wood notes, and other ethereal flavors. It was interesting but rough and coarse with plenty of dry tannins. (I agreed with Roland in that I thought it a mature Rioja.) *** Now. Imported by Bacchus Importers. This wine is 100% Nebbiolo sourced from calcareous and clay soils that was fermented in stainless steel then aged in 3.5 years in Slavonian oak casks. Alcohol 14.5%. This was a medium+ dark garnet color. The nose was great and eventually piercing. In the mouth were ripe, concentrated fruit flavors that had power but were balanced against the tannic structure. The tannins had a citric edge with good weight that continued to complement the cool tasting red and blue fruit. **** Now-2030. Imported by Vias Imports. Alcohol 14%. There were slight aromas of polished wood notes and I must agree, fennel. This fruity wine was dense with strength to the very focused black flavors. *** Now-2025. Imported by Michael Skurnik Wine. Alcohol 8%. This was a medium golden amber. The nose was incredibly aromatic with a little honied note. In the mouth were maturing flavors that were taking on a soft edge. The wine had a weighty middle with ripeness and lovely, lively acidity. The flavors were vibrant and clean. **** Now-2030. I was still rather full from breakfast and lunch when I walked into Cork Market on Monday. 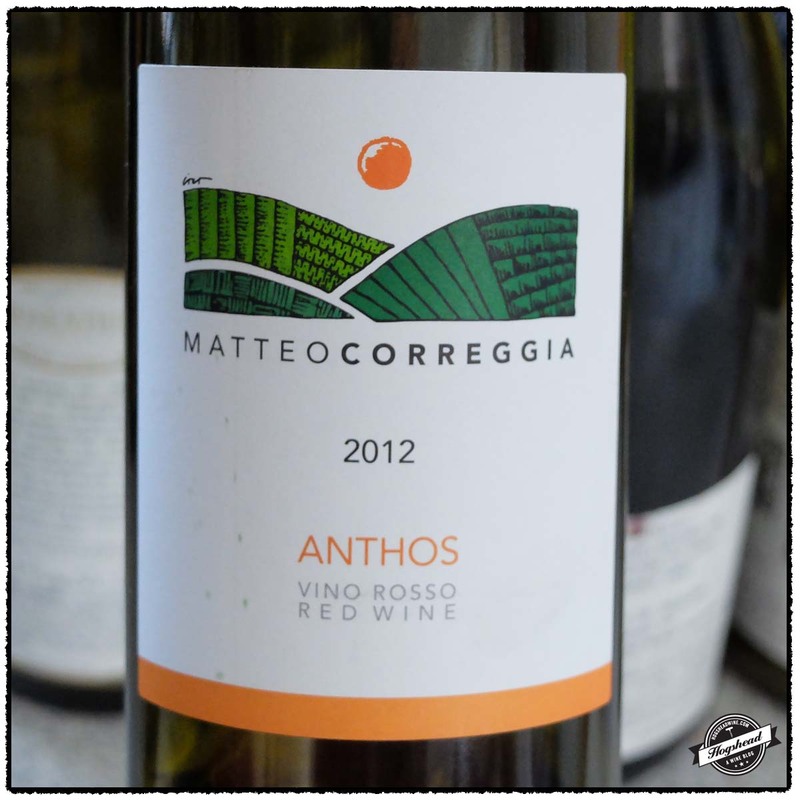 I decided I wanted to drink lighter wines that evening and immediately knew that my sole purchase had to be the 2012 Matteo Correggia, Anthos. For the third vintage in a row, this wine proved thoroughly pleasing. It is unique in aroma and flavor with orange peel, spices, and black tea making it a wine worth seeking out. 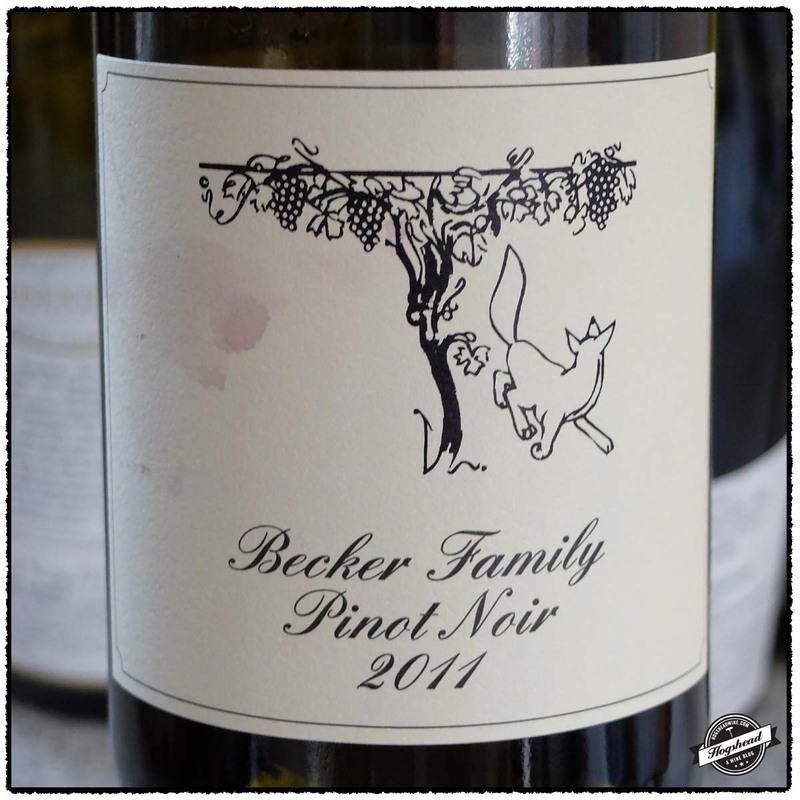 The 2011 Becker Family, Pinot Noir, Pfalz is a solid example of German Pinot Noir. It could be better in a year, I do not have enough experience to guess, but if you try it now be sure to double-decant it a few hours ahead of time. 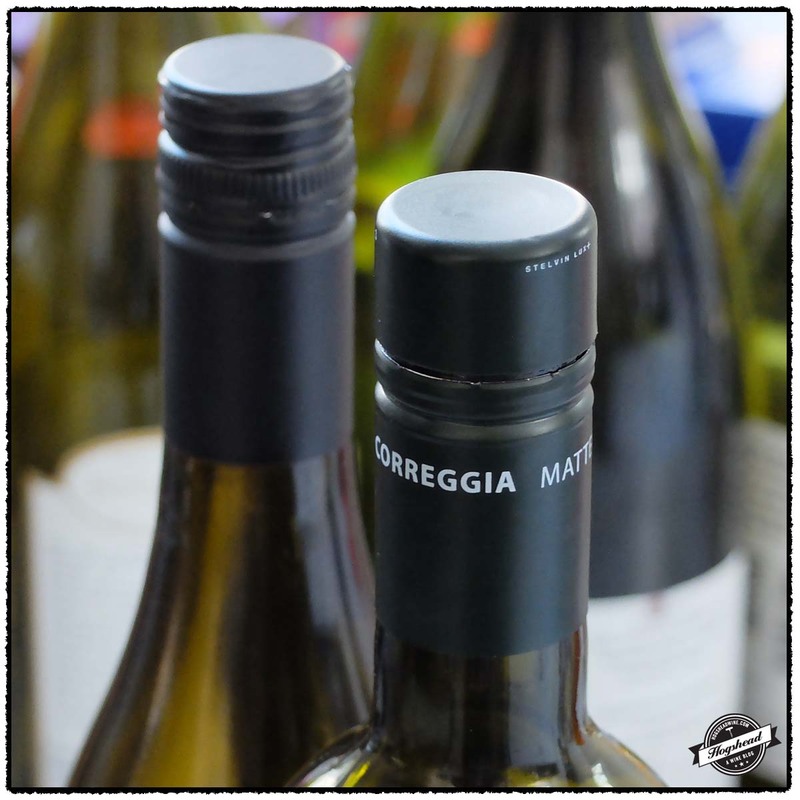 The Correggia was purchased at Cork Market & Tasting Room and the Becker at MacArthur Beverages. Imported by The Country Vintner. This wine is 100% Brachetto sourced from the Anthos vineyards. It is located at 300 meters on soils of sandy with a small bit of silt and clay. It was fermented in stainless steel for up to four days. It was then racked to a large stainless steel tank for eight months of aging. Alcohol 13.5%. The light color in the glass makes way to an aromatic nose of orange peel and spices. The flavors follow the nose but were more robust than expected. There was watering acidity, a fresh herbal middle then notes of sweet, Early Grey tea in the long aftertaste. It tastes young so should drink well for a few years. *** Now-2018. Imported by Rudi Wiest. 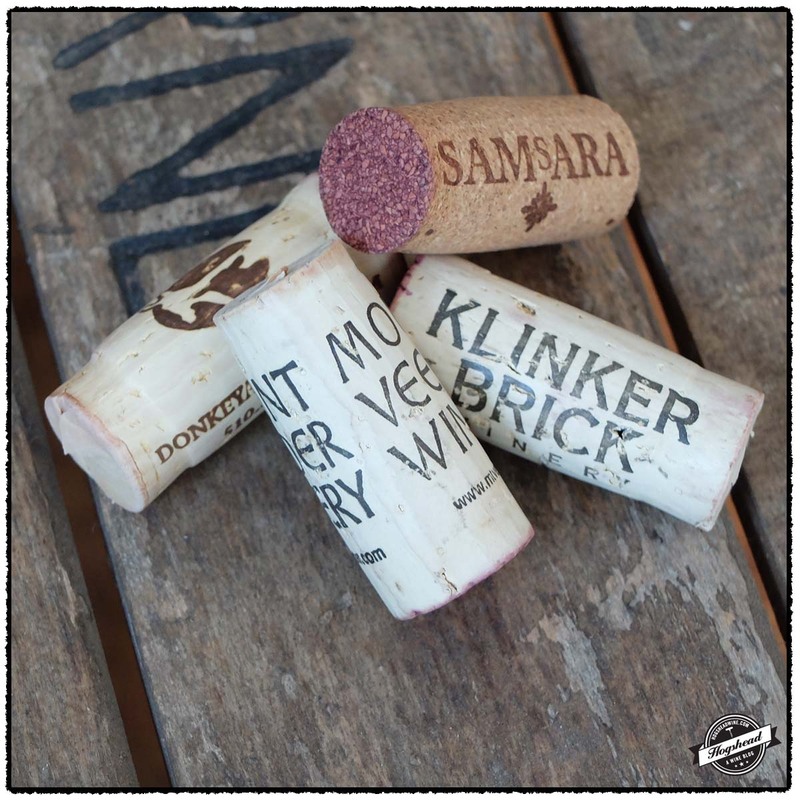 This wine is 100% Pinot Noir sourced from vines on soils of loess, marl, chalk, and clay. Alcohol 13.5%. The nose eventually opened to smell of the varietal. The flavors were lively on the tongue with sharp acidity on the tongue tip. The wine rounded out some but bore firm, linear flavors into the finish. It was a little woodsy with less flavor in finish. ** Now-2017.